Five for Friday and Ultimate Freebie Celebration! Some how 4 day work weeks still seem sooo long! 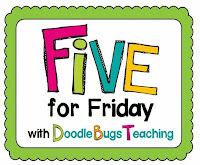 So to review this super-long short week I am linking up with Kacey at Doodle Bugs Teaching for her Five for Friday linky! 1. 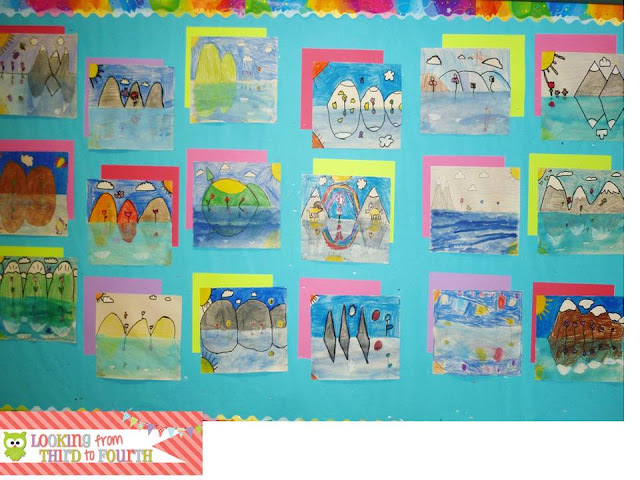 More spring art - I found an art idea on Pinterest (of course) that lead me to this blog post from Tamara at Teaching with TLC for a symmetrical summer picture - we called ours spring instead of summer and I think they turned out pretty good. 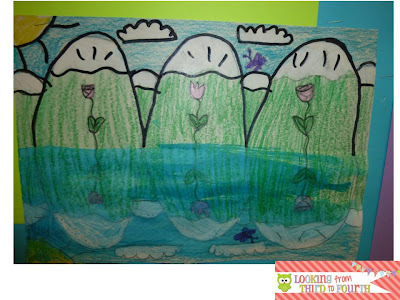 Very simple to do - all you need are crayons and watercolor paint! This just happened to tie in with last week's math lesson on symmetry. Click here for a spring symmetry freebie. 2. 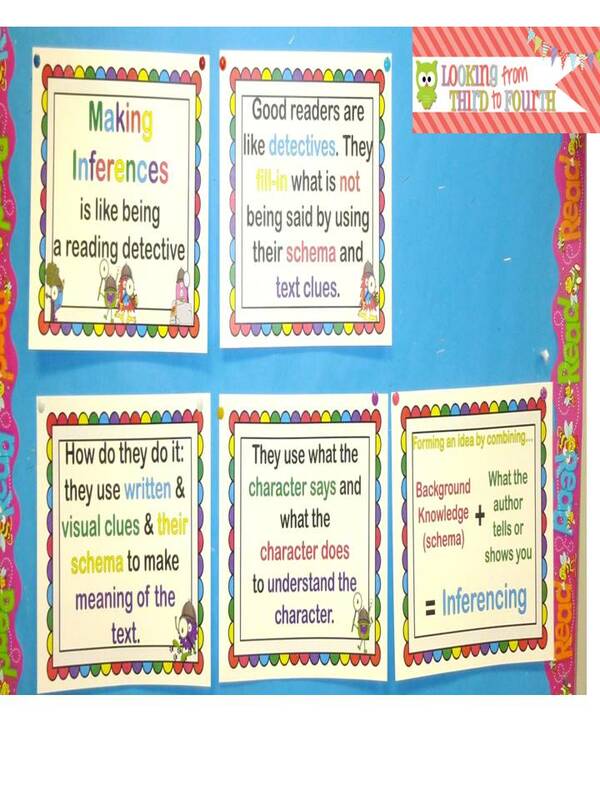 Making Inferences - we are focusing on making inferences and we are loving it. This is our anchor board so far. 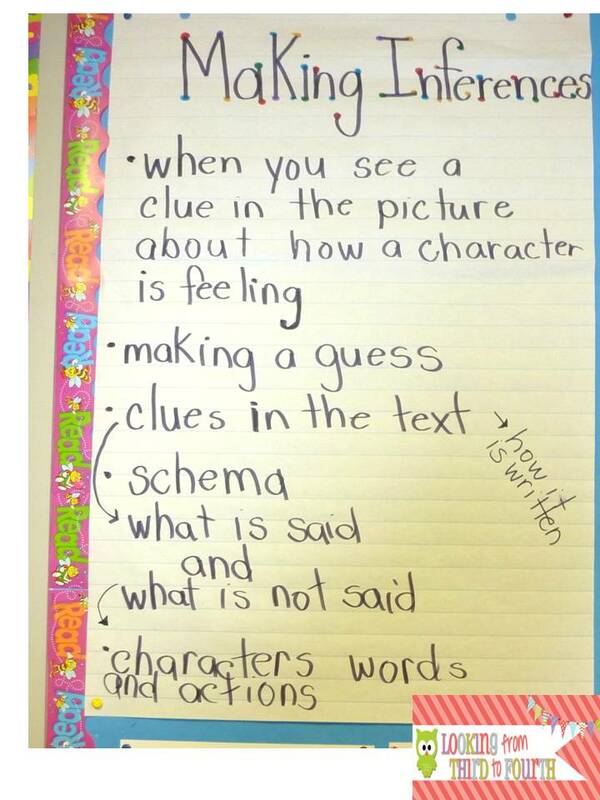 I will be sharing more activities from our unit next week. Click here to pick up the mini-posters freebie. 3. 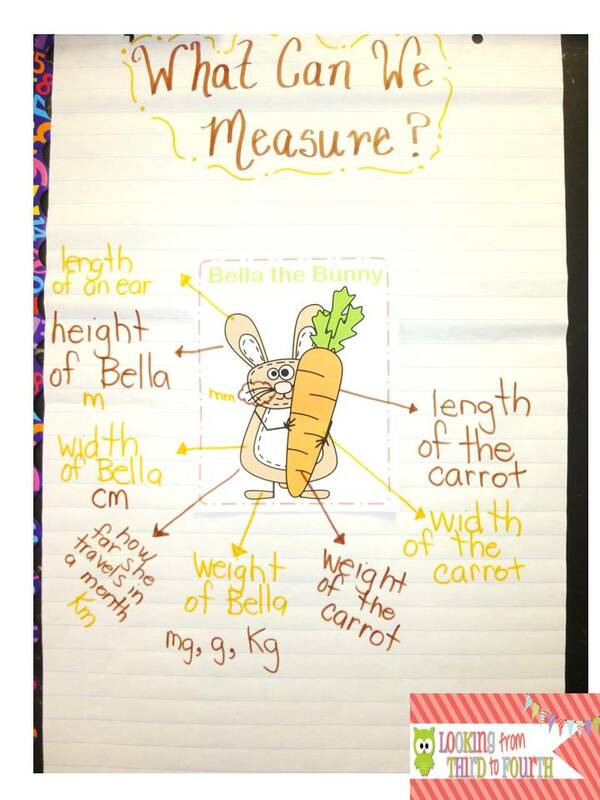 Measurement confusion and success - we started our unit on linear measurement using an activity from my unit. 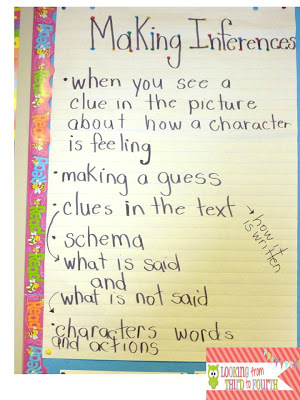 We brainstormed all the ways we could measure and then we brainstormed what units of measurement we would use. Now I did not record all of their answers on the chart because their answers were inches, pounds, feet etc. Which are great answers if you live in the U.S. - only we live in Canada and we use the metric system. It was like pulling teeth to get them to remember what we use - maybe it was the four day weekend! We are now successfully using centimetres and millimetres to measure and can convert measurements back and forth! You can check out the unit here. 4. Rain in the forecast - I'm so excited that there is rain in the forecast, why, because finally it is not snow!! I was on yard duty on Wednesday and there were snow squalls!!! I was still wearing a winter coat, mitts and a hat on April 3rd. Bring on the rain - at least it isn't snow. 5. Happy 2nd Birthday to TBA - I can't wait to spend some time (hours) checking out all of the amazing freebies that have been linked up to celebrate! 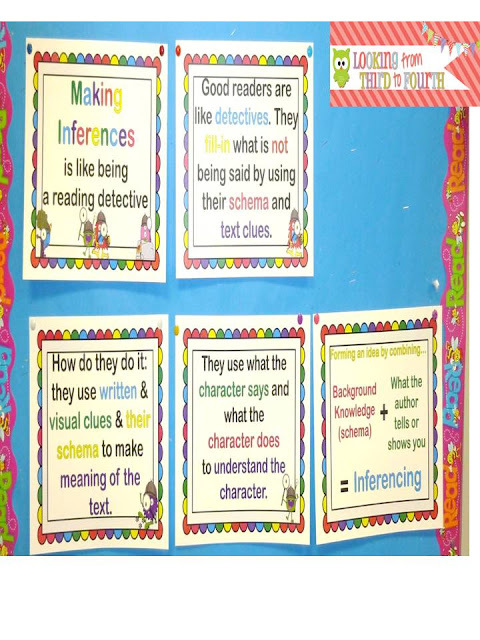 Click on the picture to head on over there to find some awesome freebies for your classroom. To help celebrate I have put everything in my Teacher's Notebook store on sale for the weekend 15% off. I love the symmetry idea! I will be doing that when we get back from spring break, and if I don't have time to do that fun activity, we will do it after that stinkin' test, which is the following week. Measurement. Sigh. So not fun for these kiddos. But your packet is super fun and that is yet another unit I have to get in the week we get back. ugh. I'm so behind!! Oh well. It's spring break and I'm takin' a break! How did I not know at this point you are in Canada?? I taught my kiddos a cute little mnemonic for the metric system order- King Henry Died. Don't Call Me. KHD.DCM - We then put the unit we're using under the decimal (meter, liter, etc) and also how much each represents under each letter (x1000, x100, x10, divided by 10, 100 and 1000). It seemed to help my kids remember what each place was! !